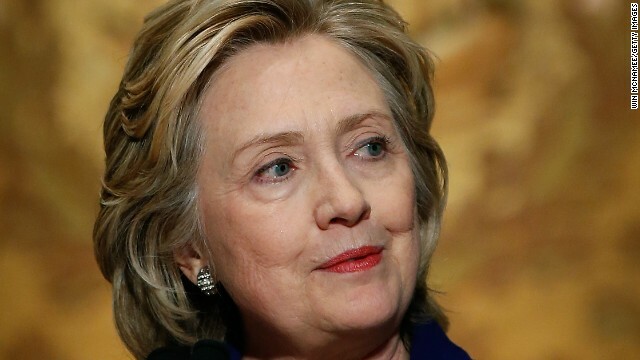 (CNN) - Hillary Clinton is the clear 2016 frontrunner in the nation's largest presidential battleground state, according to a new poll. A Quinnipiac University survey of Florida voters indicates the former secretary of state, who's seriously considering a second bid for the White House, has leads from seven to 21 percentage points over potential GOP presidential candidates in possible 2016 showdowns. "Former Secretary of State Hillary Clinton may be taking some criticism recently in the news media and among some liberal Democratic precincts, but nothing has changed among average voters in Florida where she remains queen of the political prom," said Peter A. Brown, assistant director of the Quinnipiac University poll. According to the survey, which was released Thursday morning, Clinton also has an overwhelming lead in the hunt for the Democratic nomination, with former two-term Florida Gov. Jeb Bush and the state's junior U.S. senator, Marco Rubio, leading the pack of potential GOP contenders. Two-thirds of Sunshine State Democratic primary voters questioned in the survey say they'd back Clinton for their party's nomination, followed by Vice President Joe Biden and Sen. Elizabeth Warren of Massachusetts each at eight percent. Biden is mulling another presidential bid while Warren has said numerous times that she's not running in 2016. Other potential candidates registered at one percent or less. Twenty-one percent of Republicans say they'd back Bush in the primary, followed by Rubio at 18%. Bush was at 27% and Rubio at 11% among Florida Republicans in Quinnipiac's May poll. Sen. Ted Cruz of Texas is at 10% in the new poll, with Sen. Rand Paul of Kentucky standing at 8%, former Arkansas Gov. Mike Huckabee – who ran for the 2008 nomination – at 7%, and New Jersey Gov. Chris Christie at 6%. None of the other possible contenders top 5%. In hypothetical 2016 general election matchups, Sunshine State voters back Clinton over Bush 49%-42%. The poll indicates Clinton leads Ryan by 13 points, Rubio by 14 points, Paul by 16 points and Christie by 21 points. A Quinnipiac poll in Colorado released last week, another swing state, indicated much closer 2016 general election showdowns between Clinton and potential GOP candidates. As for the current occupant in the White House, the survey indicates President Barack Obama has a 44%-52% approval/disapproval rating among Florida votes, compared to 46%-50% in May. The Quinnipiac University poll was conducted July 17-21, with 1,251 registered voters in Florida questioned by telephone. The survey's overall sampling error is plus or minus 2.8 percentage points. "but nothing has changed among average voters in Florida where she remains queen of the political prom," said Peter A. Brown, assistant director of the Quinnipiac University poll." Word on the street is that Michele Bachmann is very, very upset no one is polling her. Indeed. She's hinting that she too is more than willing to step up to the plate. And this "queen of the political prom" thingy? It is beneath CNN. -First women president of USA. Let conservative republicans bark, bow, bow, bow–like dogs. Yes on Hillary16. That's nice, but I gotta tell ya' at this rate of polling it's going to be a loooong and arduously boring road to 2016. "And this "queen of the political prom" thingy? It is beneath CNN." Agreed. It's pretty s-xist and belittling. Next they'll be using demeaning phrases like "belle of the ball" and "star of the political pageant." -republican trash better get some clue here, this nation sees a biggest change, nonetheless old, junky, no good, brainless, uneducated, racial few, NRA thugs outcry–it is changing for betterment. Started with Healthcare to all Americans no deny by BCBS. God bless!! Hillary16. CNN would make that claim, whether it was true or not. "She's hinting that she too is more than willing to step up to the plate." Hopefully, 'Murika is smart enough not to feed her and leaves her plate empty this time. Hey. I'll pardon you if you will work on getting me out of time out by passing the word that I say "hi" to WUP. She will be president if she runs , and she will run . how much will the GOP spend to loose this time ? A Hillary has a 7 point lead over Jeb Bush? Perhaps, the Florida electorate was not as enamored with his governorship, as we have been led to believe by the Fox Fable's echo chamber? It probably doesn't hurt at all that the leading Republican contenders (Huckabee, Rubio, Ryan et al) are all quite insane. "Hopefully, 'Murika is smart enough not to feed her and leaves her plate empty this time." In this instance I would say "Murika did finally wake up. Empty plate is her only future, and she knows it. Yes it is all a big government / MSM / Illuminati / Bengherzi / Darth Vader cover up. Republican political operatives and talk show entertainers have much to worry about. After a year of mud slinging and personal attacks, Hillary's poll numbers are still strong. Hillary in 2016! ""Hopefully, 'Murika is smart enough not to feed her and leaves her plate empty this time." In this instance I would say "Murika did finally wake up. Empty plate is her only future, and she knows it." Well, I suppose one might wonder how she planned to eat with her feet in her mouth anyway. Where is camel-faced guy, Peeyush Zindhal? I absolutely think it is wonderful when the GOP/TP contenders open their mouth and just let loose and tell us how they feel 'bout stuff! You can just see middle of the road voters inching to the left! Yeah, yeah, yeah, we heard all this stuff in 2008 and an incompetent community organizer buried her. Hillary Clinton always looks good on paper and then she gets out there and screws up the campaign and opens her mouth to put her foot in it. Democrats are really deluding themselves if they think the country is going to vote for another inexperienced novelty act after 8 years of the Obama nightmare. ..."Come along if you feel like room without a roof.....because we're HAPPY!!!" Hey. I’ll pardon you if you will work on getting me out of time out by passing the word that I say “hi” to WUP. Trying to sneak and post while working will do that to you! ☺️☺️ GM ladies! !